Make Miis of your favorite people and watch surprising things happen. What happens when friends, family, and celebrities become Mii characters and live on an island? Tomodachi Life—that’s what—and it’s exactly the type of crazy that memories are made of! Give Mii characters items, voices, and personalities, then watch as they rap, rock, eat donuts, fall in love, get denied, and have little Mii babies. Wait…WHAT?! 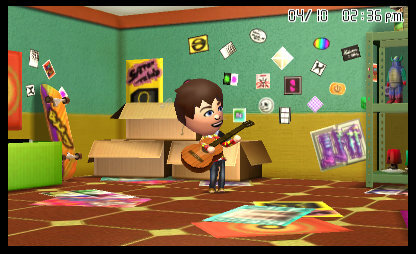 Create Mii characters, customize their voice and personality, dress them up, and decorate their apartments. Then watch as they come to life! 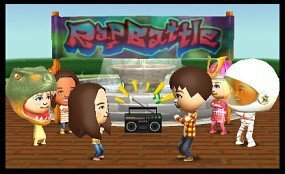 They hang out, play concerts, engage in rap battles, hook up matchmaker-style, and even partake in cool games like Tomodachi Quest, a mini-RPG adventure. And when something really epic happens, take a picture and share it over Nintendo Image Share. * Or, send a baby Mii on a journey into your friend’s game with the StreetPass feature. Expect the unexpected because your Tomodachi Life is about to begin! *Wireless broadband Internet access required for online play. Go to support.nintendo.com for more info. Guitar - Let your real personality shine through as your Mii! Catsuit - Customize your Mii as much as you want to, down to personality, voice, and more. Rap Battle - Engage in an epic rap battle with your favorite friends, family members, or celebrities that YOU created! Relationship - See what happens when two Miis fall in love!